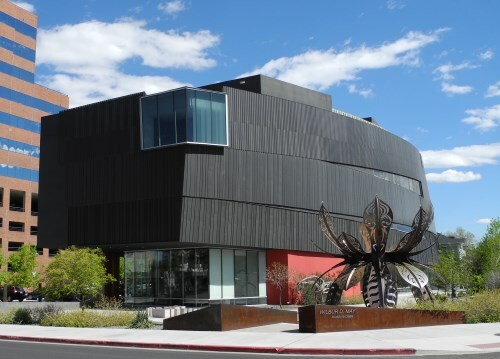 Reno is fortunate to have the world-class Nevada Museum of Art. This community asset brings some of the world's most outstanding art and artists right here to Reno for all to enjoy. If you would like to try your hand at an artistic endeavor, or enhance the skills you already have, there are classes for both adults and children at the Museum. Explore our Nevada Museum of Art and you will be amazed and surprised at what you find. It's free admission for everyone on the second Saturday of every month. The occasion is the "Hands ON! Second Saturdays" event, featuring a day of storytelling, hands-on art projects, tours, and other presentations. There is a different theme each month, with stories and projects to match. This is an especially good day for families with children to visit the Museum, though everyone is free to participate or just enjoy the current exhibits. For details about the monthly theme and activities, visit the Museum Event Calendar. The Nevada Museum of Art is located at 160 West Liberty Street in downtown Reno. The information phone number is (775) 329-3333. Free parking is available in the Museum lot. Nearby street parking includes both free and metered spaces. General Admission is $10. Seniors (60+) and Students are $8. Children ages 6 to 12 are $1. Children 5 and under are free. Museum members are free. Also free are high school students enrolled in the Washoe County School District with valid school ID. Museum and Museum Store hours are Wednesday to Sunday, 10 a.m. to 6 p.m. and Thursdays, 10 a.m. to 8 p.m. Closed Mondays, Tuesdays and national holidays. The Nevada Museum of Art is the only accredited art museum in Nevada. It was founded in 1931 as the Nevada Art Gallery by Dr. James E. Church, a professor at the University of Nevada, Reno. A new facility was provided by the E.L. Wiegand Foundation in 1988 and the name became the Nevada Museum of Art/E.L. Wiegand Gallery. The four level building we enjoy today opened in 2003. It houses the Nevada Museum of Art, the Donald W. Reynolds Center for the Visual Arts, and the E.L. Wiegand Gallery. For more, refer to "History" on the Museum's website.